Support for the MSB-IoT board. The MSB-IoT was developed at FU Berlin and is based on a STM32F415RG MCU. 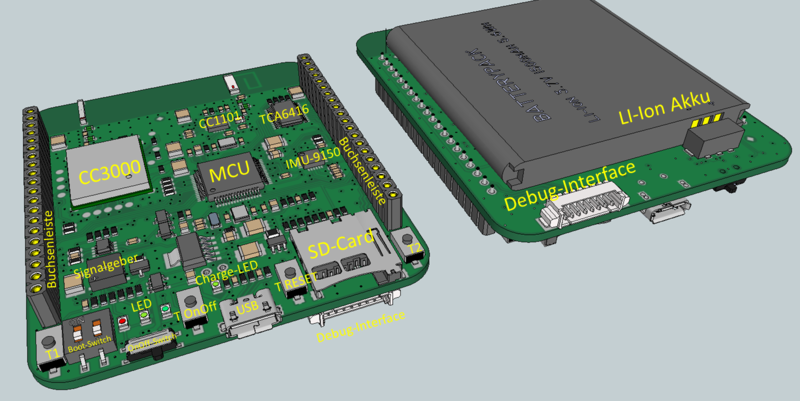 The centerpiece of the MSB-IoT is the STM32F415RG MCU. With a maximum frequency of 168 MHz it offers high performance for a microcontroller of its category. The STM32F415RG comes with a huge set of accessible communication interfaces and features that are listed here. Due to licensing issues, RIOT's driver implementations for the STM32F4 series are not based on ST's standard peripheral library. Therefore, not every feature of the MCU is currently supported in RIOT. RIOT uses its own naming scheme for GPIO pins and other functionality. The actual STM32F4 specific pins and functional units are mapped to RIOT internal enum values. Please refer to this document for RIOTs pin mapping for the MSB-IoT (the document only lists ports where a PIN is mapped). The pin mapping can be altered freely by editing the boards/msbiot/include/periph_conf.h header file found here. Please keep in mind that changing pin mappings that are important for the integrated hardware could affect the corresponding driver implementations. The most important mappings needed for correct operation of the MSB-IoT with RIOT can be extracted from the boards/msbiot/include/board.h found here. The user buttons are mapped to GPIO_0 (Button T2) and GPIO_8 (Button T1) in the board's default configuration file for RIOT. To configure and use the buttons, you can use the provided interface functions from RIOT's GPIO low-level driver interface. Pushing the reset button will always reset the board and restart your application. The LEDs can be controlled inside your RIOT application by using the LED macros provided here. There is also a yellow charge LED on the board indicating the charging process of the battery. The board's beeper allows for acoustic feedback. It needs a PWM signal between 1-5 kHz and is mapped to GPIO_5 and PWM_0 in RIOT. To configure and use the beeper inside your application, you can use the provided interface functions from RIOT's GPIO and PWM low-level driver interfaces. The board has an integrated CC1101 Sub-1GHz RF Transceiver which is connected to the MCU using the SPI. The transceiver allows for energy-efficient local communication in the frequency band below 1 GHz. The CC1101 is configured as the defaulttransceiver for the MSB-IoT in RIOT (see here) and the necessary driver files are automatically included for applications that use the defaulttransceiver module. 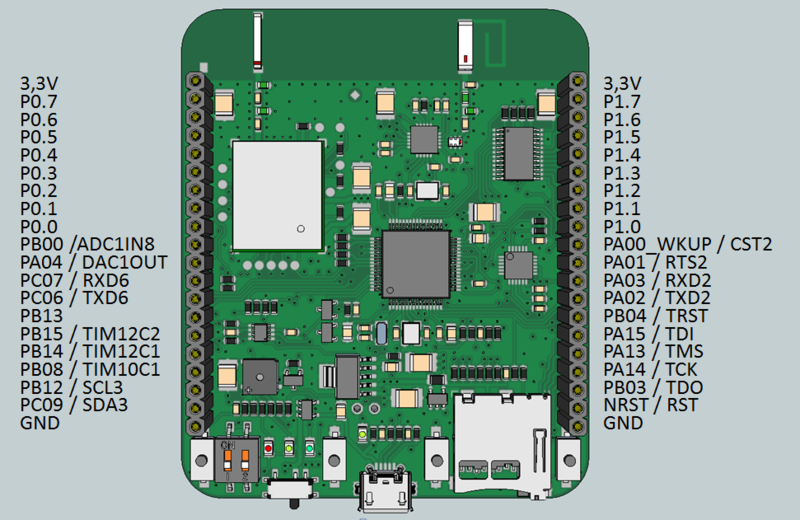 In addition to the CC1101, the MSB-IoT also features a CC3000 Wi-Fi Module. The CC3000 is a self-contained wireless network module with a full embedded IPv4 TCP/IP stack that for example allows to use the MSB-IoT as a gateway node to the internet. Please note that the CC3000 only supports operation in infrastructure mode and therefore always needs to be connected to an access point to be used for communication. The CC3000's driver implementation for RIOT includes the full driver provided by Texas Instruments. The API documentation from TI can be found here. To use the CC3000 in RIOT, just add USEMODULE += cc3000 to your application's Makefile. The driver for the CC3000 is not yet merged into RIOT's master branch. Please see pull request #2603 for progress on the inclusion. The MSB-IoT is equipped with a MPU-9150 MotionTracking Device from Invensense. The device combines a gyroscope, a magnetometer and an accelerometer in one module. Due to licensing issues, the current MPU-9150 driver implementation for RIOT is not based on Invensense's 'Motion Driver' library and offers only a limited set of features. Nonetheless, the RIOT driver allows to configure and read values from all three sensors of the device. For an overview on the supported features, you can check the driver's interface. A sample RIOT application for the MPU-9150 that utilizes the driver can be found here. This section only covers the automated functionality provided by RIOT's makefile system. If you don't want to rely on RIOT's make targets for flashing or debugging (for instance to use a different flashing tool), please check the documentation of your used tools. We strongly recommend the usage of the GNU Tools for ARM Embedded Processors toolchain for the MSB-IoT. Support for other toolchains was not tested! RIOT's provided functionality for debugging and flashing the MSB-IoT is based on the Open On-Chip Debugger tool. A wiki page with installation instructions and some other information can be found here. For a quick getting started guide you can stick to the steps explained on this page. Just make sure to use "msbiot" as the respective board name. Building application "hello-world" for "msbiot" with MCU "stm32f4". Step 2: Done. The MCUs USART2 is used as STDIO. Board specific definitions for the MSB-IoT board.